If you have to read one graphic novel this year (or of whatever year is left), I highly recommend you read “Mooncop” by Tom Gauld. It is a heartbreaking and extremely real graphic novel on loneliness and how we deal with it, even if it is on the moon. The year is unknown and pretty far-off into the future. Space has been colonized for mankind – a reach for the stars project, which is now a reality. There are people living on the moon and everything is the same – though it can get very boring and this happens to one of the lunar officers of the law. This colony on the moon is half-forgotten and no one cares about it, so much so that most people are on their way out. The cop is lonely and doesn’t have much to do. The book unfolds beautifully, of which I shall not speak more. It would then mean giving away the plot which I don’t want to. We are all lonely and we all try and make do with what we have, which is exactly what the nameless protagonist of this graphic novel does. The life lead is in a bubble, of oxygen-rich air and a metaphorical bubble of bureaucracy. Yet, there is this beauty in which Gauld communicates everything through his drawing and characters. There is humour and there is a lot of hope in it. In such a short graphic novel, Gauld says what he has to and that’s the beauty of the graphic form. You don’t need all that space or words to say what you have to. “Mooncop” is one of those rare graphic novels that you have to pick up right after you have finished reading it. 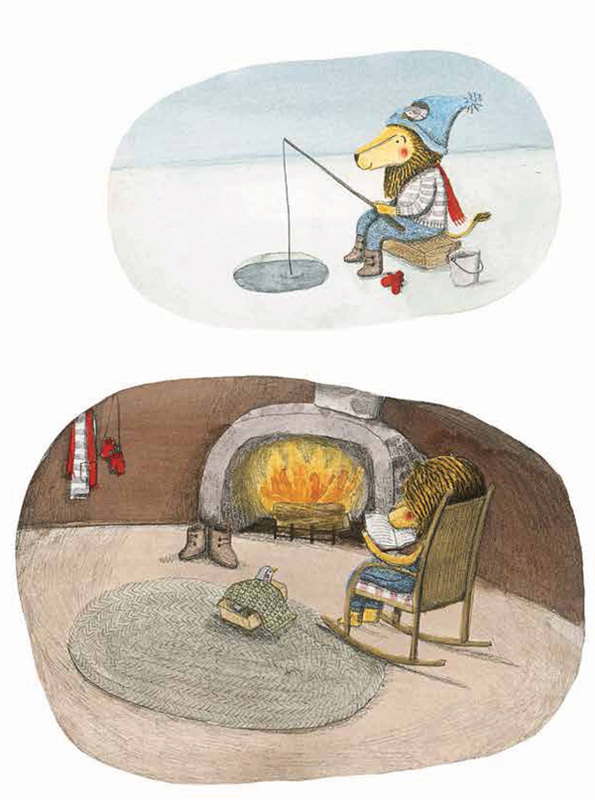 It is heartwarming, nostalgic and a beautiful meditation on life and loneliness. This entry was posted in 2016, Authors, Authors I Love, Books, Drawn and Quarterly, Graphic Novel, Graphic Novels, Graphic Novels Reading Project, Review and tagged Drawn & Quarterly, Graphic Novels, Loneliness, Mooncop, November 2016 Reads, Reading Projects, Space Settlement, Tom Gauld on November 13, 2016 by thehungryreader. Once in a while you read something that shakes your core. It jolts you out of the mundane existence and makes you question everything and everyone around you. Has that ever happened to you? Have you ever felt so compelled by art? Nayyirah Waheed’s poetry did that to me. It made me want to drop everything, leave everything behind and go and find myself. It had that kind of an impact. I am this close to perhaps even doing that. I don’t know why it felt the way it did, but I honestly believe that if any work of art can drive you to this point or to tears (which also happened by the way) then it is an indication that you wake up, smell the coffee and do something about what is going on – in your life and also to perhaps make a better change in someone else’s life as well. “salt” is a collection of poems by Waheed on the condition of being black, feeling alienated, how the heart is empty and bereft, how does one heal after all, and of various other matters of the heart and soul. Each poem comes with a word at the bottom – the poem defines the word – gives it meaning and that is the format of this collection. I don’t know what more to say about this magnificent collection of poems. I have no words, honestly. I don’t even know if I would be doing the book any justice at all by talking about it. “salt” is the kind of collection of poems that will rip your heart out, toss it a little, turn it a bit, throw it far away, make you realize what you have lost, make you fetch it, repair it and let it heal. A stunning collection of poems. This entry was posted in 2016, August 2016 Reads, Books, CreateSpace, Nayyirah Waheed, Poetry, Review and tagged african writing, amazon, August 2016 Reads, CreateSpace, feminism, Healing, kindle unlimited, Loneliness, longing, Love, Nayyirah Waheed, Oppression, Poems, Poetry, salt on August 13, 2016 by thehungryreader. There are very few books that come along and change your life. You do not know in what way, but after reading them you are not the same and you can feel it so strongly that it takes your breath away. This happened to me when I read the most astonishing and enchanting picture book I have in a very long time. French Canadian graphic designer and illustrator Marianne Dubuc gives us this little piece of joy and ecstasy called, “The Lion and the Bird”. I had a problem procuring my copy since it is not easily available in India, but when I did receive it, I knew that I would love and cherish it forever. 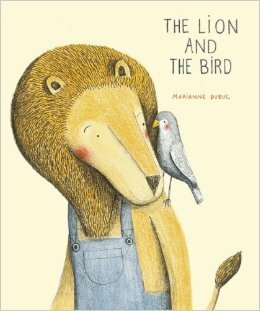 As the title suggests, the book is about a lion and a bird. That is what it is. A lion finds a wounded bird one autumn day and his life changes in so many ways. He takes the bird in, heals it, and throughout autumn and winter the bird stays with the lion. They build a beautiful friendship and bond, which must come to an end because the bird will soon heal and fly and the lion will be left alone, as he was before the bird came into his life. 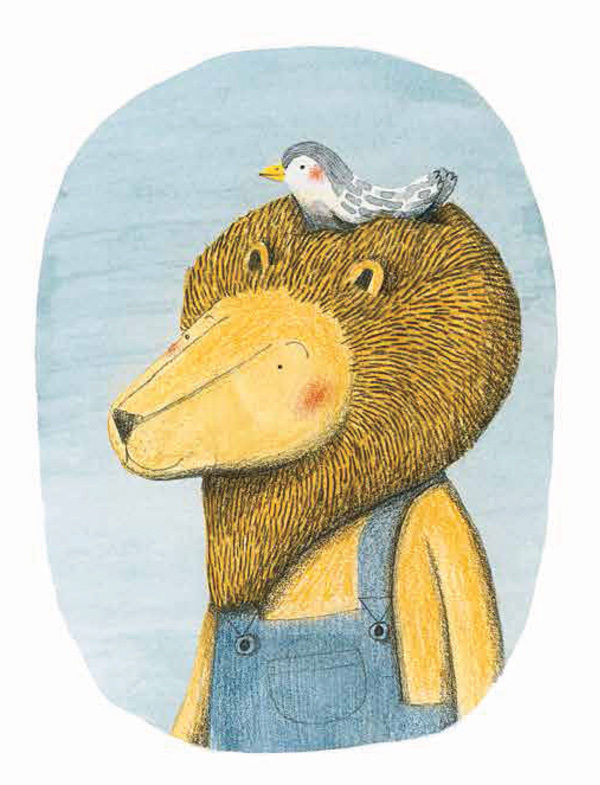 “The Lion and the Bird” is an ode to childhood and in so many ways an ode to adulthood as well. We all need to learn so many lessons as we go along – that of empathy, of being selfless sometimes, of understanding another’s sorrow and pain, and what life is truly about. 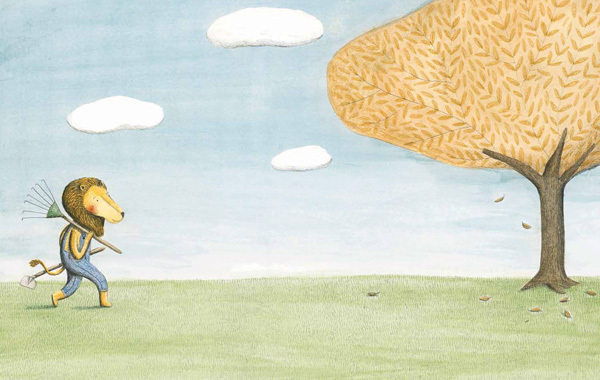 Marianne’s illustrations and use of space are breathtaking. 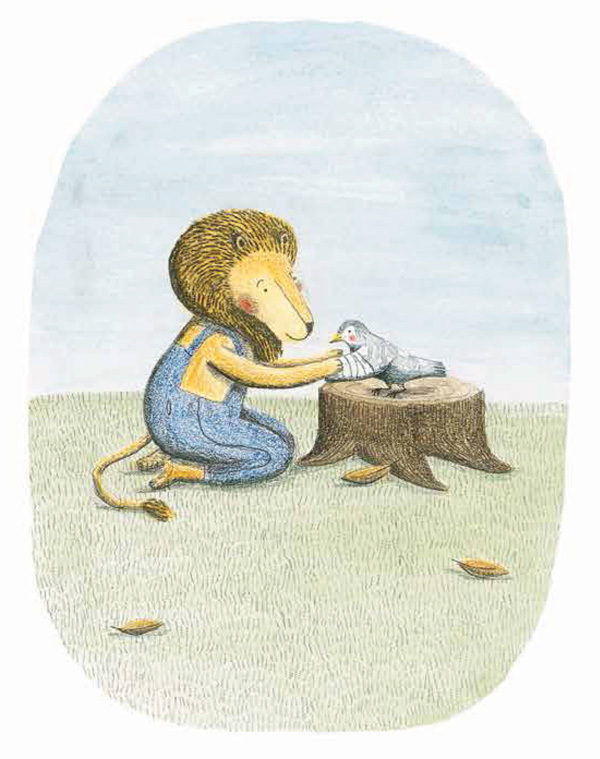 The loneliness of the lion is depicted tenderly as he shrinks after the bird’s departure. The use of space is marvelously done and with great minimalistic effort. This book is so appropriate for both adults and children. The eloquent pictures and story (almost wordless) go hand in hand and the words just become unnecessary. This is this beautiful rhythm to the book and though it is short, it just stays with you forever. This entry was posted in Authors I Love, Books, Children's Books, children's fiction, Enchanted Lion Books, Picture Books, Review and tagged animals, Birds, Children's Books, empathy, Enchanted Lion Books, family, friendship, growing up, Lions, Loneliness, Love, Loyalty, Marianne Dubuc, The Lion and the Bird on March 23, 2015 by thehungryreader. Off late, say in the last decade or so, there has been a spurt of graphic novelists and artists from all over the world. 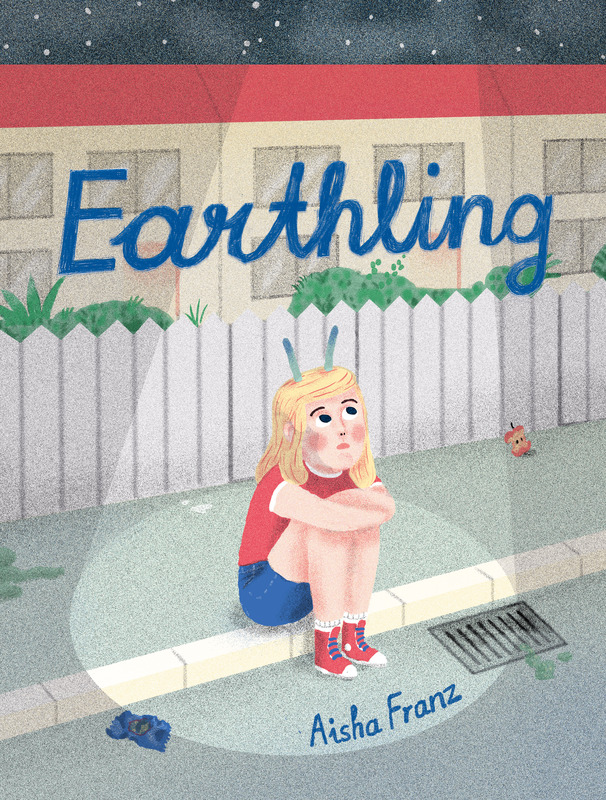 “Earthling” by Aisha Franz is not just another graphic novel. There is something about it, which speaks to you and which hits the nail right on the head of the problem of our society today: Alienation and Loneliness. The graphic novel is also a coming-of-age story of two sisters. It is about their estranged mother. A father that is supposed to take them on a trip which none of the girls wants to go to. The mother dreams of what could have been had she not got pregnant early in her life. The older daughter wants to be accepted. The younger one is confused about life. All the three of them want is some semblance to a regular life and happiness. The setting is the suburbs – unknown places, a big industrial wasteland and vast fields with nothing to talk about. In all of this, each of these three characters has built a fantastical element to their stories. They find their solace and comfort there. Franz’s setting itself is another character. The black and white illustrations also add that bleak element to the story. I think “Earthling” to me is more than just a story about coping with life. It is also to a very large extent about finding yourself midst all the noise and silences. The book, in its graphic elements relays a lot – on the human condition, how we are and yet there is a glimmer of hope somewhere for these people to perhaps want something more and get it after all. I loved “Earthling” because it was for sure a different graphic novel and to some extent also reminded me of Daniel Clowe’s characters, all wandering and trying to find their way in the world. This entry was posted in Books, Drawn and Quarterly, Graphic Novel, Review and tagged Aisha Franz, alienation, Drawn & Quarterly, Earthling, german, graphic novel, Loneliness, Suburbs on January 4, 2015 by thehungryreader.